Rosella A. Heydinger, 103, of Tiffin, died at 9:23 a.m. Tuesday, Nov. 6, 2018, at St. Francis Home. 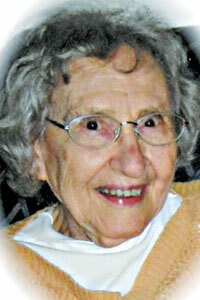 Rosella was born Sept. 21, 1915, in Bismarck, to Fredrick and Ottilia (Gerber) Missler. She married Ralph C. Heydinger May 24, 1941, at St. Sebastian Catholic Church, Bismarck, and he died Jan. 9, 1998. Survivors include two sons, Dennis Heydinger of Allen, Nebraska, and Clayton Heydinger of Tiffin; a daughter, Katie Gates of Findlay; four grandchildren; seven great-grandchildren; and a brother, Herman Missler of Bellevue. She was preceded in death by her parents; her husband; a brother, Elmer Missler; and seven sisters, Henrietta Frisch, Joanna Missler, Marcella Scherer, Lucille Schneider, Irene Oeder, Rita Felker and Zita Huss. Rosella was a homemaker and a member of St. Joseph Catholic Church. Visitation for family and friends will be 9:30-10:30 a.m. Saturday, Nov. 10, at St. Francis Home Chapel, the funeral Mass will begin at 10:30 a.m. with the Rev. Joseph Szybka officiating. Burial will follow in St. Bernard Catholic Cemetery, New Washington. Memorial contributions may be made to St. Francis Home or a charity of the donor’s choice. Traunero Funeral Home and Crematory, 214 S. Monroe St., Tiffin, OH 44883, (419) 447-3113, assisted the family with arrangements. For directions, out-of-town flower orders or to offer condolences to the family, go to www.traunerofuneralhome.com.